Superbowl XLVIII - GO SEAHAWKS! This entry was posted on January 28, 2014 by Jessica Anderson. 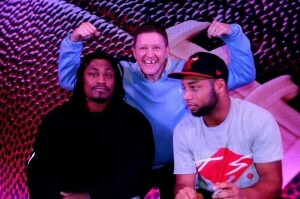 Seahawk players Marshawn Lynch and Golden Tate with a classic Jeff pose - Crazy & Toothless! The countdown is on! The game of the year, Superbowl XLVIII, is only a few days away. The Seattle Seahawks face the Denver Broncos this Sunday, February 2nd, in New Jersey. The hawks are making their second appearance in the championship, hopefully bringing home their first Lombardi Trophy. For a city that has never won a Superbowl, this is epic to say the least. What an amazing NFL football season it’s been! The Seahawks have been HOT all year, with 13 wins, 3 losses, clinching the NFC Championship game vs. San Fransisco. Our city and fans have responded. Yes, the Hawks have been to the Superbowl before in the recent past, but the hype this time is much stronger. 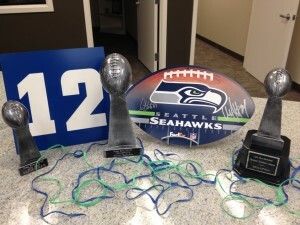 Not only are the Seahawks players local heroes, but the Pacific Northwest is seriously sick with 12th Man Fever!!!! 12th Man signs, flags, and jerseys are everywhere you look. It's super exciting! Our Lombardi-style trophies in our showroom are ready for a Seahawks win! My family will be spending Sunday with many friends, plenty of food and beverages, kids running a muck, dressed in our Blue and Green 12th Man finery. We are thrilled to be living in the PNW, cheering our team on to victory! Enjoy the game and GO SEAHAWKS!